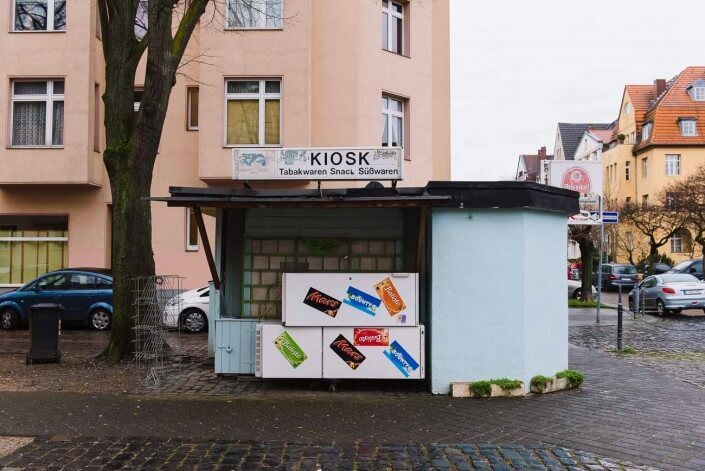 Colourfully painted huts, designer kiosks, corner shops, artfully welded ocean cargo containers – no two of Cologne’s Büdchen, or kiosks, are the same. 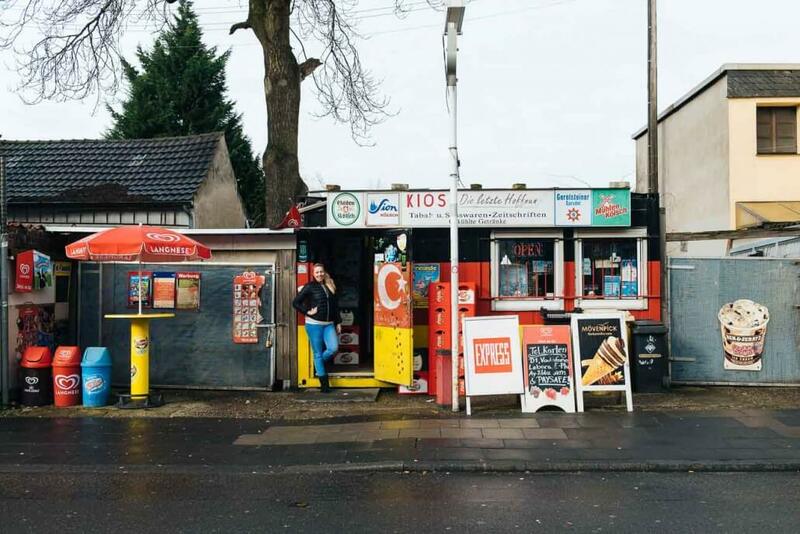 Around 550 of these tiny convenience stores are dotted around the city. Some of them have been around for decades. 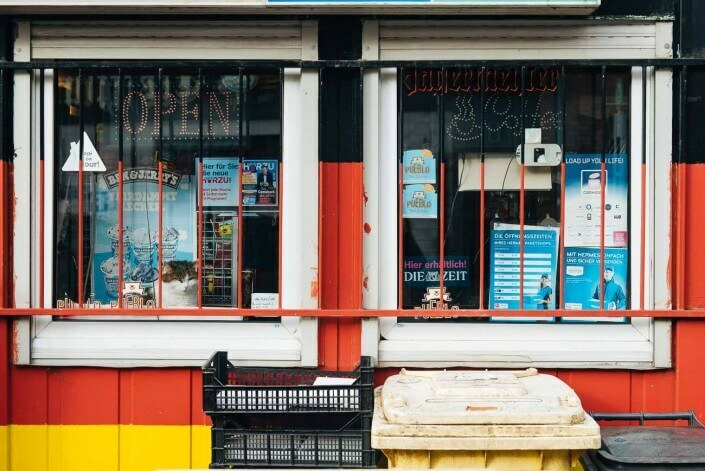 However, their very existence is under threat due to ever longer supermarket opening hours and the increasing range of products in fuel station convenience stores. Many Büdchen owners simply aren’t able to keep up. Let me introduce you to three of these lovable institutions. 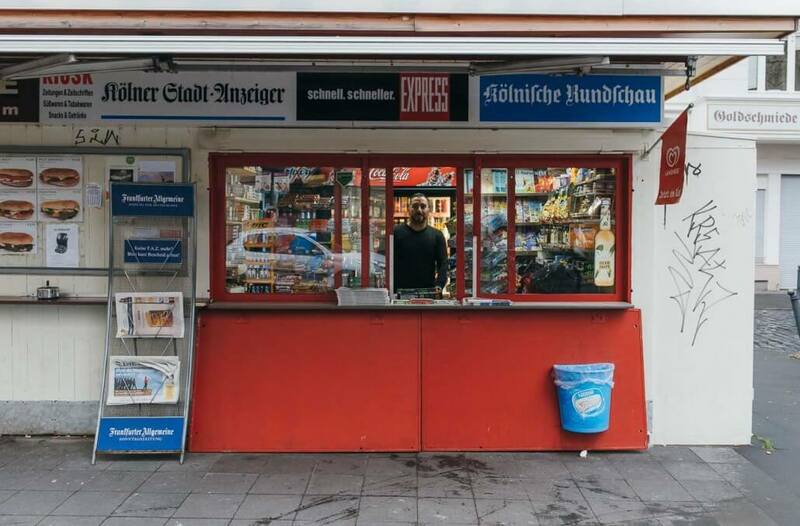 Called “The last hope” in German, Die letzte Hoffnung in Rondorf is run by 24-year-old Hatice Sezer and her family. A slightly odd name at first glance, but it makes complete sense to the good people of Rondorf who realise, just before they sit down to Sunday breakfast, that they’re missing some vital ingredients. Die letzte Hoffnung is literally their last hope for a jar of Nutella or a pint of milk. Ever since the 2006 football world cup, the Sezer family’s tiny business has featured the colours of the German flag – a brilliant marketing idea by Hatice’s dad that turned the Büdchen into an instantly recognisable feature in the calm suburb of Rondorf even before Germany took home the cup. Having chatted to Hatice for a few minutes I already feel like I’ve known her all my life. 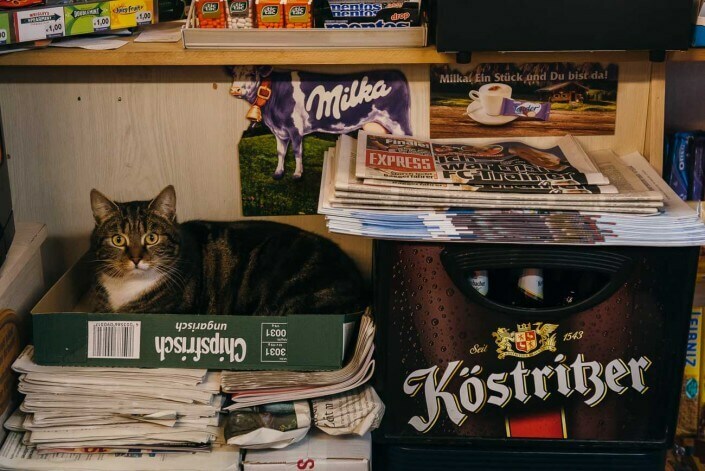 She plies me with hot coffee and as we chat, customers drop by, Hatice inquires about an old lady’s leg injury, and one of the Büdchen cats curls up in the corner for a nap. Everyone’s infected by Hatice’s sunny nature, and I’m no exception. Pico Coffee is one of the oldest and probably most photographed Büdchen in town, a genuine institution in the heart of the Agnesviertel district. In the summer, children play in the square while their parents sit and enjoy a coffee or a beer. 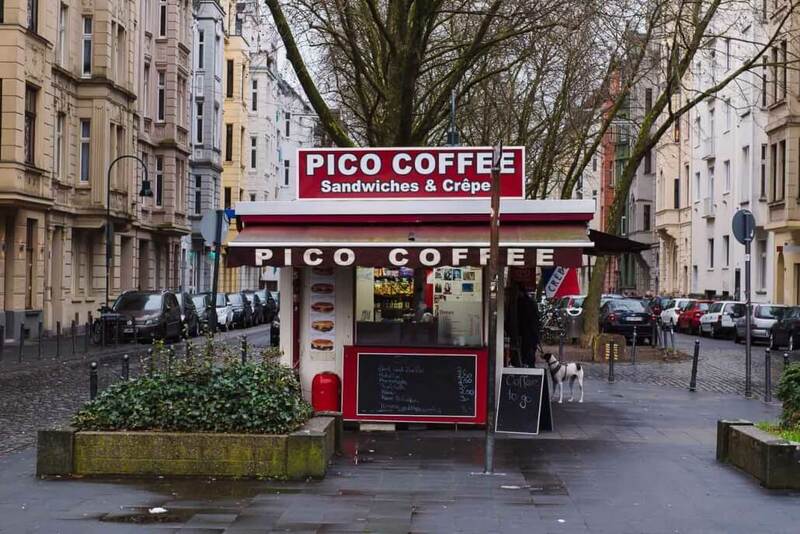 Pico Coffee is excellently adapted to residents’ needs – in addition to the typical range of Büdchen products they also sell delicious, freshly cooked crepes. As I tuck into a tuna crepe, families with children stroll by, many interrupting their morning walkabout to park their bikes and prams and order a coffee. This place has a great vibe even on grey days. This Büdchen has seen a lot of action, but on most days it looks like it’s closed down for good. However, rumour has it that on warm summer evenings, it comes alive. Tommy Engel, lead singer of the traditional Cologne band Bläck Fööss, grew up just across the road from the kiosk on Lotharstrasse, so it’s entirely possible that this tiny Büdchen on Nikolausplatz inspired some of what are probably Cologne’s best traditional songs. If I’ve managed to pique your interest in Cologne’s Büdchen culture, you may want to take a look at ‘Am Büdchen‘. In 2014 Cologne-based amateur photographer Stefan Matthiessen decided to dedicate an entire project to these charming Cologne institutions and began to photograph the crème de la crème of Cologne’s Büdchens. He’s already managed to photograph around 90 of them. A selection of his photos even made it onto the pages of the first Büdchen calendar ever in 2015.